Which running backs are worth targeting on the NFL free agent market this offseason? While the goal for virtually every NFL team is to build the foundation of their roster through the draft, for many teams, the easiest route to take to pick up a player at a position of need is through free agency. Last offseason, we saw running backs Lamar Miller, Matt Forte and Alfred Morris, among others, sign with a new team. Here we’ll take a look at the top 10 running backs who are, potentially, about to hit the open market. To see Pro Football Focus’ full NFL free-agent rankings featuring the top 50 players set to hit the market in 2017, click here. It’s more of a matter of when, not if, Bell is placed under the franchise tag. If he hits the open market, though, not only is he the best free agent RB, he’s the best free agent, period. Bell has finished each of the last two seasons as our highest-graded running back, and finished among the top-10 in each of his first four pro seasons. Few players will have more to prove in 2017 than Eddie Lacy. Lacy earned an 86.0 overall grade in 2014, which ranked third-best among RBs that season. Since then, though, he’s dealt with a very public weight battle, and that, compounded with some injuries, have resulted in him barely cracking our top 50 free agents list in 2017. Lacy forced 73 missed tackles on 287 total touches in 2014 (one every 3.9 touches); since the start of the 2015 season, he’s forced only 51 missed tackles on 282 touches (one every 5.5 touches). Blount led all RBs in 2016 with 18 rushing touchdowns and ranked eighth with 1,161 rushing yards. However, as PFF’s 68.1 overall grade for him would indicate, his production stats weren’t necessarily indicative of his level of play. Of the 12 running backs to eclipse the 1,000-rushing-yard threshold this past season, Blount and Indianapolis’ Frank Gore were the only two to not average at least 4.0 yards per carry. Blount has always been a one-trick pony, and at 30 years old, that’s not changing. If you’re an NFL team who has a passing-down back, though, and is looking for some competence on first and second downs, Blount may be a decent bet. Latavius Murray has been given two years now as Oakland’s starting running back, and the results have been serviceable, but certainly not great. Murray finished this year ranked 21st among RBs with a 73.1 overall grade after putting up a 70.0 overall mark in 2015. Murray isn’t overly elusive with the ball in his hands, as his 31.9 elusive rating (PFF’s elusive rating metric distills the impact of a runner with the ball independently of the blocking in front of him) ranked 33rd among running backs this season He also doesn’t offer much as a receiver. Rodgers was a mere afterthought entering the 2016 season, but injuries to both Doug Martin and Charles Sims thrust him into a starting role for a chunk of the season, and he really took advantage of that opportunity. Rodgers’ 76.5 rushing grade—the highest of his career—ranked eighth among qualified RBs this past season, and he’s traditionally graded well as both a receiver and pass blocker. It’s unlikely that Rodgers ever turns into a top-tier three-down back, but he’s proven that he can fill a large role over short spurts; if you’re a team looking for backfield depth, or looking to add a competent third-down back with some upside, Rodgers makes for an intriguing option. Ellington is a bit of a wildcard free agent this offseason. The 28-year-old running back exploded onto the scene in his rookie season back in 2013, when he finished the year with the sixth-highest overall grade among all RBs, at 81.1. He followed that up with a disappointing 2014 season, and has since been completely overshadowed by David Johnson in Arizona’s backfield. Ellington presents an interesting case to prospective teams, because he’s still under 30 years old and has fewer than 1,500 NFL snaps to his name. He has an outstanding season under his belt that he can point to, and it’s relatively unknown which had more of an impact on his decline in snaps, his own poor play or the emergence of Johnson? What Williams has been able to do into his mid-30s is pretty remarkable. In the 2015 season—at age 32—Williams earned a 78.9 overall grade over the course of 715 snaps, which ranked eighth among RBs. Williams had a much more limited role in 2016—his snap total dropped to 336—but he still produced, finishing the season with a 72.9 overall grade, 23rd-best among qualified running backs. Burkhead has received a very limited number of snaps over his three-year NFL career, but he enjoyed his most expanded role last season, and he thrived within it. Burkhead averaged 3.03 yards after contact per attempt in 2016, which ranked 12th among all RBs receiving at least 50 carries, forcing 15 missed tackles on 91 total touches. The biggest question the 32-year-old Woodhead this offseason is how he recovers from a torn ACL that cost him virtually all of the 2016 season. When healthy, Woodhead has proven that he’s capable of being one of the premier pass-catching threats out of the backfield. Woodhead led all running backs with 755 receiving yards in the 2015 season, and his 1.91 yards per route run mark ranked fourth among all RBs who received at least 50 targets in 2015. Jennings graded positively as a runner in 2015; in fact, his 71.7 running grade that season ranked 23rd among all RBs. His performance in that department fell off a cliff in 2016, however, as his 55.3 running grade from this past season ranked 53rd out of 55 qualifying RBs. Jennings can bring a veteran presence to a backfield, though, and still does one thing extraordinarily well: pass protect. Jennings ranked first among all qualifying running backs this past season with a pass-blocking efficiency rating of 98.3, as he allowed just one total QB pressure on 60 pass-blocking snaps in 2016. (PFF’s pass-blocking efficiency metric is a weighted formula that combines sacks, hits and hurries relative to how many snaps a running back stays in to pass protect.) Jennings has allowed just seven total QB pressures on 160 pass-blocking snaps since the start of 2014. 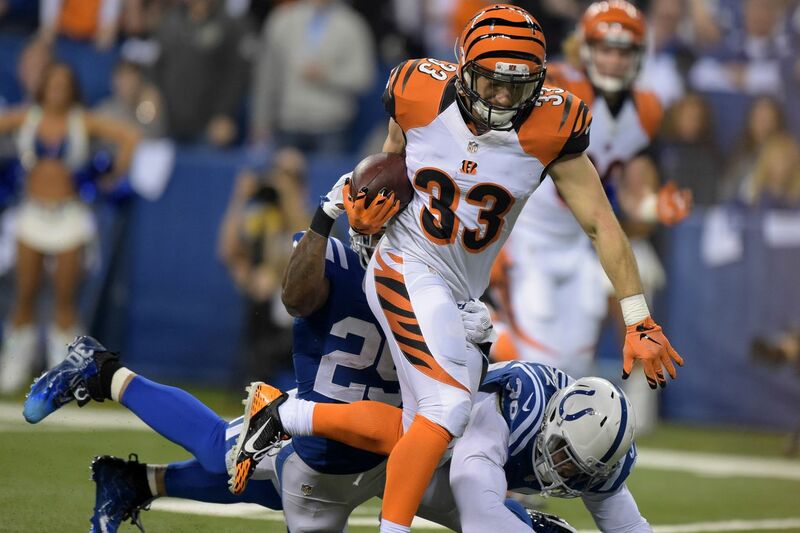 What will happen with Rex Burkhead?